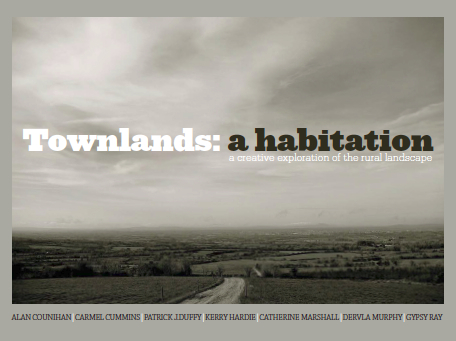 Townlands: a Habitation has been on the shelves of selected bookstores since early December 2012. This 148pp full colour publication, produced and edited by Alan Counihan, features specially commissioned essays by travel writer Dervla Murphy and historical geographer Patrick J. Duffy, along with poems and prose pieces about their local landscapes by poets Kerry Hardie and Carmel Cummins. The book also contains two essays and visual portfolios by Alan Counihan along with two portfolios of photographs and drawings by visual artist Gypsy Ray. The Foreword is by Catherine Marshall, first Head of Collections at the Irish Museum of Modern Art. The subtitle of the book is : A Creative Exploration of a Rural Landscape. It is an exploration of how we, as individuals and communities, find identity in landscape and place. W.G. Hoskins described landscape as ‘the richest historical record we possess’ and in the pages of this book we explore that record in the specific context of a particular landscape and examine the way in which it has shaped our relationships to our place in the world. We discover that landscape is not just what we see in terms of geology, fauna or flora but that it is often a cultural construct born of a view or experience of the world that has been handed down to us. This book is a celebration, through both word and image, of our place in the world and the meaning of home. ‘From family names, field names, memories and perceptions they have woven a portrayal of their place in Ireland to inspire the new interest in the local and enduring’. Michael Viney, Irish Times. ‘The book…offers a a flavour of the diversity of what the Irish countryside offers while also delving into specific examples of folklore, place names, culture, history and social mores to highlight the extraordinary treasure that lies, in many instances, beneath our feet.’ Matt O’Keefe, Irish Farmers Monthly. Available through all good bookshops nationwide.